I'm going to wrap up battleship month around here with an amusing duel between L4 mission solo masters, the Raven Navy Issue and the Scorpion Navy Issue. Let's start with this: if you're wanting to do L4 missions solo, you now can't go wrong with either of these ships. Both of them do great damage, tank like beasts, can tune their damage and their tank to any kind of rats you desire, and can hit both short- and long-range rats with full DPS regardless of the amount of attention you're willing to pay to the mission. 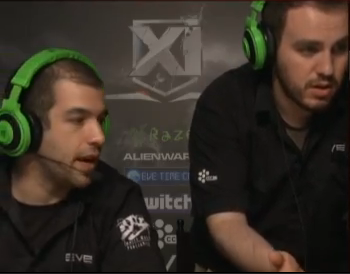 The Mittani once only semi-joked that EVE players should judge their income not in ISK/hour but in ISK/effort. On that scale, both of these ships are low-effort, high-ISK winners. They're both expensive, and worth it. The Navy Raven is the king of low-effort L4 solo'ing since the changes made not too long ago wherein rats attack drones with gleeful abandon. CCP Rise's changes to the ship have only made it better. In particular, the new explosion radius bonus is fantastic for PvE and cuts the explosion radius of cruise missiles to 180m which means full damage to rat battle cruisers and more damage to rat cruisers. It was fairly typical to fit Warhead Rigor rigs to missile ships but the Navy Raven doesn't need them. You also no longer need to compromise in the mids: you can fit a full tank, target painter, and propulsion mod (or Sensor Booster). CPU remains extremely tight compared to the previous model and you'll have to buy an eighth Cruise Missile Launcher (expensive if you use faction ones like the recommended fit). You'll also probably have to use at least the two shown faction Ballistic Control Systems to make the fit work, plus you'll need to train Weapon Upgrades V. You can add a third faction BCS if you wish, but it only adds about 10 DPS, so it probably isn't worth it. As you can see, the fit is nearly identical in every respect. The Scorp only needs six CMLs, adds a utility high slot and an additional mid slot, but loses the explosion radius and missile velocity bonuses. As a result, SNIs generally compensate with a Rigor rig or two; two of them make its explosion radius virtually equal to the RNI. The Scorpion also has a slightly smaller drone bay. The ships have one thing in common: they both tank like beasts. The Scorp's base tank is much better, and its resilience is ridiculous. If you're a nervous sort of solo missioner -- and with the cost of these ships, that's understandable! -- the Scorp is custom-built for you. The Raven's tank, though not quite as good, is less susceptible to cap pressure. The Scorp needs to pick a rat and NOS it to ensure cap to run its Shield Booster. The Raven does not. (Alternately you can fit a Cap Booster with either ship in case of dire emergencies, though you'll probably sacrifice your afterburner to do so.) But overall, the Scorp has the better tank. And if you use faction CMLs, the Scorp will be significantly cheaper. The Raven's advantages are DPS (it has 840 or so, compared to the Scorpion's 800), an additional flight of light drones (which can be used as armor maintenance bots to keep the ship's other drones repaired), and quickness. The Raven has both a higher base speed (important in acceleration gate missions) and higher agility. The Raven also has a much higher alpha strike with a single volley of missiles, making it more possible to one-volley rat ships off the field. If you're a more aggressive sort of L4 missioner, the Raven is your boat. Flying the ships themselves is virtually identical in all respects. The Scorp will have to pick a target within 25km to leech capacitor from, but both ships have a target painter, shield booster, and light or medium drones to manage. Short version: turn on hardeners, pick rats, hit F1 until they disappear, pick more rats. Use your afterburner as needed to traverse acceleration gates. Start pulsing your shield booster as needed as your shields drop through 50% or so. In the unlikely event you start running out of cap before everything is dead, warp off and try again. It's pretty low effort. The major downside to these ships is of course the expense! As of this writing, either hull will cost you about a half billion ISK, the faction CMLs are 60 million each, the faction BCSs are 90 million each, and the faction XLSB (which given the DPS you do is probably optional) is about 180. You can and should go with meta or T2 gear if your wallet won't stand the strain, though your DPS will suffer accordingly if you do. Of course, meta or T2 gear will also make you less of a gank target, so it's a trade-off that each missioner has to decide for him- or herself. One thing is certain, though: the RNI or SNI hull itself are a very large upgrade from the base Raven hull for missioning, so if nothing else you should definitely start there. For many players, it's their first truly expensive purchase. I want to again send my congrats to The Initiative for this moral victory and the bit of flying that ensured its doom. 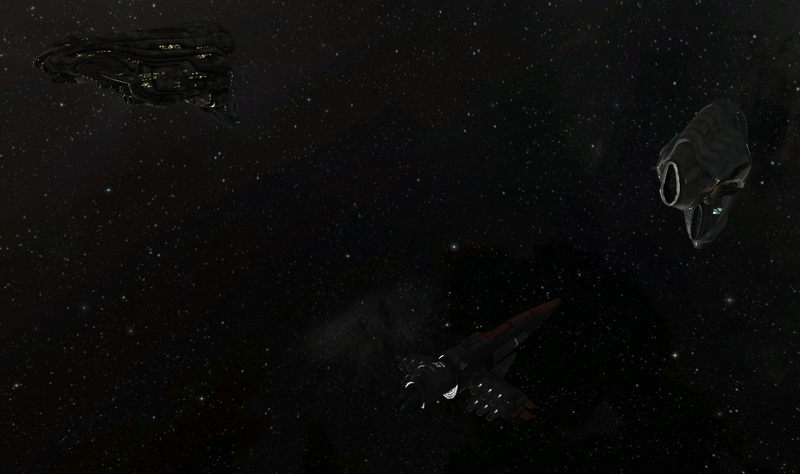 During the match, Initiative pilots were trying to maintain tackle on an Utu. fmercury's was the second one caught; the first one slipped the net. At the moment this Utu was caught, Initiative performed what is typically called a "damp dump". This involves putting every Sensor Dampener available on the team on the opposing team's logistics ship. Suddenly, that ship's lock range is immediately and drastically reduced, right at the moment the surprisingly fast Utu (the others were going up to 3450m/s) tries to break away from everyone, including his own logi. In this moment, Initiative pilots applied the DPS needed to crack this little frig. Nice job! Lots of people sent me this Ark loss, which makes me wince every time I look at it. In this case, the pilot in question jumped his JF to a cyno generator (mistake #1) positioned next to a POS with no guns (mistake #2) without bothering to send so much as a frigate through first to see if there was anyone in system (mistake #3). Needless to say, there was, a Rapier which snagged the prize that either couldn't or didn't simply jump out to another cyno during the Rapier's decloak or lock delay (mistake #4). Then the big dog came in and ended the ship, which was apparently full of every single thing this player has ever owned in EVE (mistake #5). That wasn't the only bit of ROGUE bad luck this week, either. As I understand it, that's a Golem that's been slowly getting blinged out, piece by piece, for months. I've flown with the pilot before and he's a really easy-going guy, fun to fly with and chat with. The story on this one is pretty straight-forward. The True Creations Research Center continues to be the hardest incursion site there is. As I said more than a year ago, there's potentially enough alpha in them to volley player ships right off the field regardless of the number of logi brought in. This is combined with a nasty Sansha neuting battleship that will shut your hardeners right down for you. That's apparently what happened here and the logi just couldn't keep up. Ouch! Anyone want to say incursions are risk-free? Three supers to talk about this week, none of them particularly remarkable. First to die was this ROGUE Nyx, lost during a POS defense op. The POS in question had two Capital Ship Assembly Arrays fitted, and the attack itself was apparently a violation of a non-invasion pact that Northern Coalition had with ROGUE. Betrayals? In my EVE? Shocking. Long story short, I fleeted him and gang warped him out. This one's simple: The target was one we'd been aware of for some time. 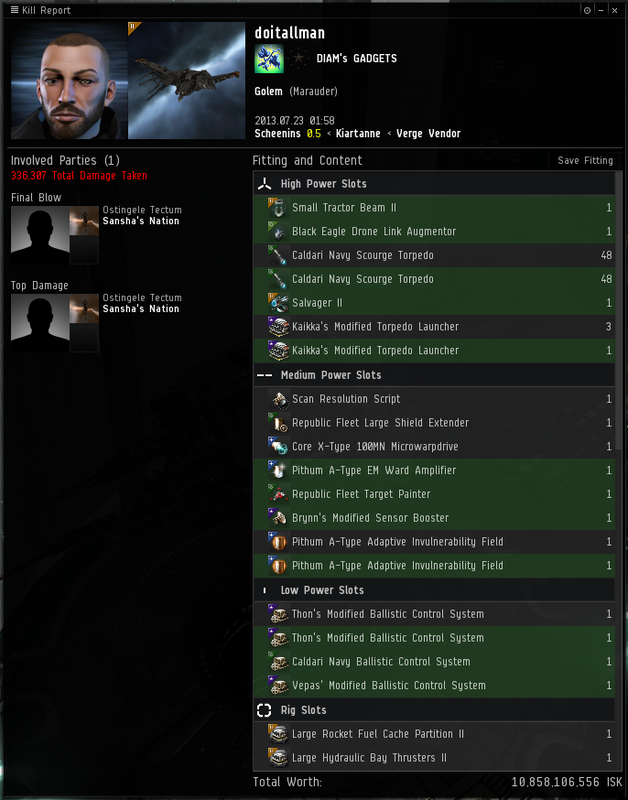 A friend told us a VoC Nyx was being sold on the forums, which meant it had to be one of two. On running locators, one was romping around nullsec, the other was in Derelik – thus matching the sale thread, and our home region. We convo'd the alt used to make the forum post and made an offer, which was accepted. He then told us the location of the ship (which we already knew ofcourse). After hours of attempting to find a third party (didn't matter, we just needed him to log in), we gave up. We then offered to just send him the isk, provided we could see the ship first, and then he'd eject from it and leave. He agreed and logged in, with 5 ex-PHEW now Pandemic Legion probing alts ready to nail his spot. Sure enough, we got him, bridged – tackled and engaged. He lasted less than a minute – even with TiDi from the 4000 man fight taking place on our node. And we already have our next target. And as I mentioned, the Li3 Avatar that went down did so about 3.5 hours after deadline, so that one will be covered next week. When I first challenged Seleene, Hans Jagerblitzen, and Alekseyev Karrde alllll those months ago early in their CSM7 term to communicate much more frequently with players, the very first response I got back was "Sometimes, there's nothing going on." My response was "Then tell the players that! That's better than what you're doing now." ...brace for a new round of things to get tearfully upset about any minute now. Yep. ;-) And I'll have more to say about HAC round two in a separate post. The one thing that is going on is the CSM separation of and voting on all of your "Reasonable things". Thank you again for all of the suggestions that those of you that participated submitted! I can tell you that lots of them have been sources of discussion in our private channel. I myself need to go through the list and do my voting early this week. Also, I've got my flight arrangements to Iceland for the Summer Summit, which is coming up four weeks and two days from today. our next stake-holder meeting this Thursday. The CFC will almost definitely attack Delve, either in a continuation of their full-scale invasion, or with prodding tests like we saw before 1-SMEB. It will give us an opportunity to put some strain on a rebuilt leadership structure and see how we function. I will be constantly reevaluating our position the entire time, but for now that’s the plan. That's from Boodabooda, leader of TEST. It's covered without comment on both TMC and EN24. It's troubling because it signals (between the lines) that there was some kind of back-channel negotiated peace offered by TEST over the weekend... and the CFC rejected it out of hand. 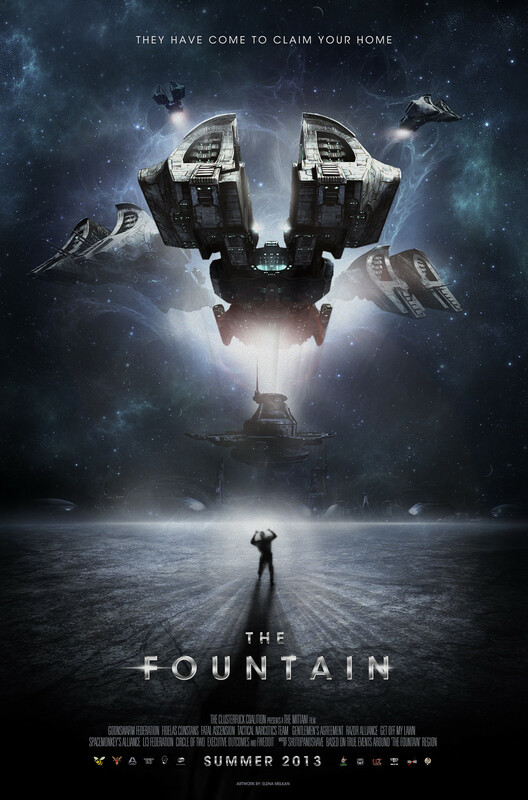 I said last week that Fountain has traditionally been the road to an invasion of Delve. Goons have about a 50/50 success rate at invading Delve. But if the CFC invades again this time, I cannot realistically expect TEST to hold. 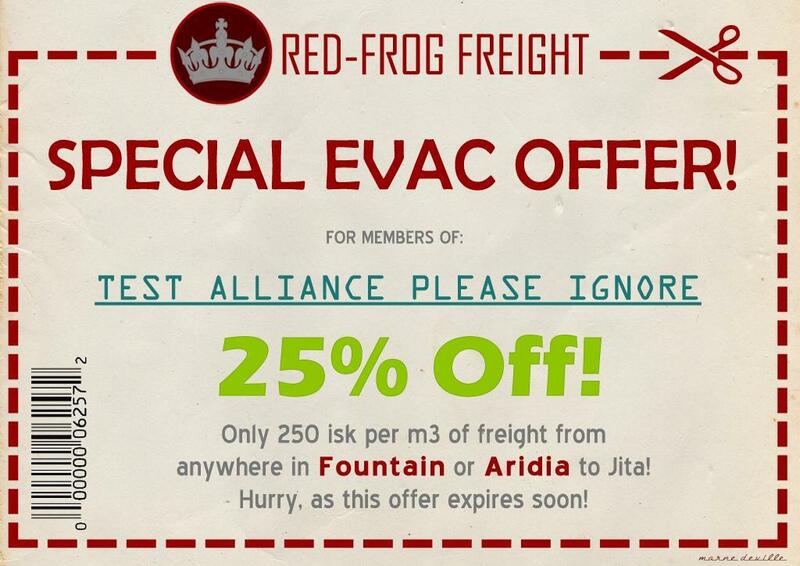 There's no better reasons for them to hold on in Delve than they held on in Fountain. Matter of fact, the opposite is true: the CFC will be charged up by their victory, flush with new cash and (quite valuable) land prizes to hand out to their allies, and will come to Delve in even greater numbers. It's not like EVE has supply lines as such. You build your jump bridge network, you put up your staging structures, and you go. In a traditional land-based war, a longer supply line hurts the attacker and benefits the defender. This is because the attacker has more territory to defend against guerrilla and flanking strikes and because the defender can implement a scorched earth policy as they fall back. It also helps in terms of "trading space for time": you fight a series of defensive actions until your industrial complex can spin up (more or less how the U.S. originally intended to fight Japan and how Russia fought Germany in WWII). But in EVE the opposite is true for all of these elements: the defenders can't follow any sort of scorched earth policy, flanking attacks in EVE are all but non-existent, guerrilla attacks are not possible, and industrial output in New Eden is all but unlimited all the time. 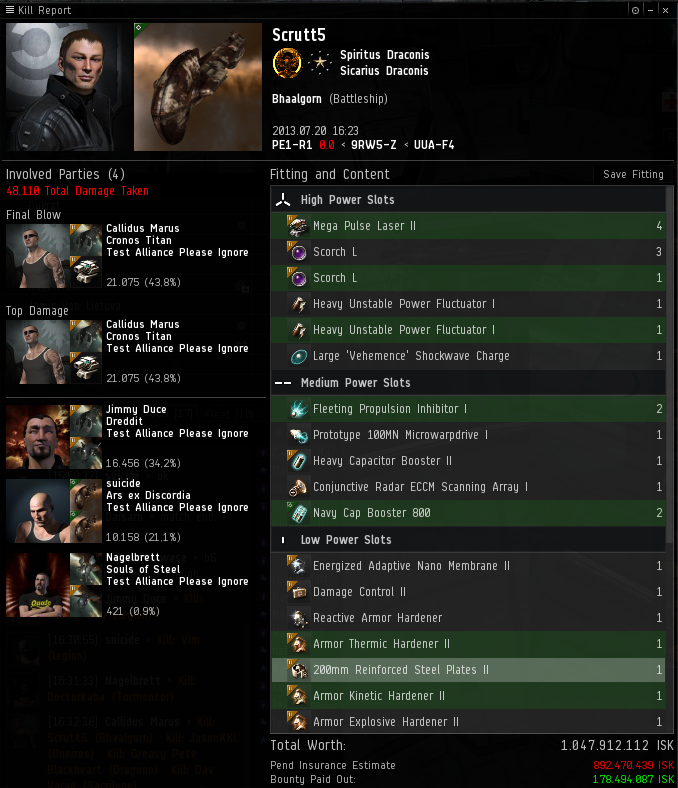 So the traditional benefits of fighting a defensive fall-back war simply don't come into play in EVE. The only benefits TEST gets from falling back are additional time to negotiate with their allies and time for the situation in the south to stabilize. But are TEST's traditional allies going to be interested in coming to their aid after one alreaady-lost lost war? I suppose it's possible. But is it realistic? All in all, I hope the Goons do not attack Delve and instead allow the current status quo to stabilize for a while. Otherwise, I can't expect TEST to hold out more than another six weeks or so and we're going to go into EVE's traditional autumn doldrums facing a very dull null-sec game indeed. I'm sure by now you've heard, but daaaaaamn. I'm not going to cover the fight itself in any detail. I wasn't there. But I do want to extend massive kudos to CCP for handling this with as much grace as was possible given EVE's architecture. ;-) Seriously, I think CCP did something really clever to keep the game running yesterday and I dearly hope we see a dev-blog about it and would be kind of surprised if we didn't. Previous record for number of pilots in the same system was apparently set on 30 October 2012 in LXQ2-T, with 3230. 6VDT-H broke that easily. Highest number I heard about was 4075 (and may have gone higher). Here's the battle report. For more about this fight, see the EVE news site of your choice. TMC has three stories so far. EN24 has four or five, depending on how you count them. Note that a titan was lost, but won't be appearing in today's KOTW report because it happened 3.5 hours after deadline. It's just possible I'll have something to say about the bigger picture when the time comes. THE R0NIN 100, Rote Kapelle 27. Sigh. What can I say? We gambled and we lost. OK, I can say a bit more. 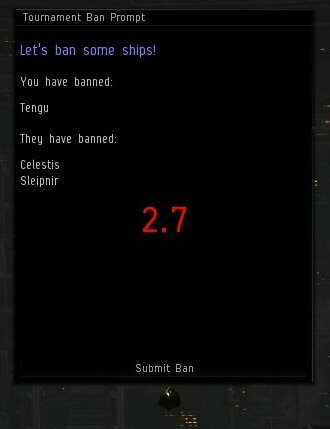 Once the bans were in -- and we followed a pretty conservative banning strategy that mostly revolves around "we think tinker is fascist and more importantly, boring" -- we had a brief strategy discussion on how to respond to the ban of both T2 armor logistics ships. I should talk a bit about how bans work first: 45 minutes before your match, you're contacted by a CCP GM or employee. He greets you, asks you to set up a fleet and identify the fleet boss, and identify the beacon you'd like your team to appear at. Then he lets you know you'll receive the ban interface. The ban interface is a little app that runs within the EVE client. It's got a 60 second timer in bright red letters, plus a drop-down box with a list of every legal tournament ship in alphabetical order. Once you've completed your bans, you have about 30 minutes until your fleet is teleported to Jove space... ready or not. As a result, you don't have a whole lot of time to decide what comp you're going to use (more on this on Friday because this is going to be a big topic next Saturday). For various reasons, we really wanted to run the basic comp that we ended up running with the Geddon/Vexor Navy Issues. So the question was: do we try to push the comp with a T1 logi? We felt like R0NIN had banned armor comps because they were concerned about armor-based Dominixes and Geddons... but they didn't want to see our Brutix Navy Issue comp either. In that way, banning the armor logi was a great way of dealing with all three possible comps with only two bans. So kudos to R0NIN there. We talked about using one of our shield comps. After some discussion, our captain Bob Shaftoes made the final call that he wanted to push forward with a surprise armor-based neut/control comp instead. It was a gamble. It went bad. That happens during tournament. Thanks to Mat Westhorpe for the screenshot! One other thing: it was rather painful to me to realize in retrospect that in the same way our match with Verge yesterday was a mirror of our match with Verge last year, our match today was a mirror of our match last year with Pandemic Legion. On one side: neut/control battleships supported by a lot of frigate razzle-dazzle. On the other, a couple of heavy DPS ships and a massive flock of assault frigs. The match went the same way. Sigh. All in all, nice job, R0NIN! Good luck against Exodus! That's gonna be a great set of matches. I'll have more to say about this match post-tournament. A few quick things about the rest of the day. CCP Fozzie tells me "the woman in the waffle dance video is the comedian and Youtube personality Grace Helbig, who is also known in the EVE community for getting CSM endorsement requests and reacting amazingly." Aheh. Thanks, Fozzie! Finally, I would be remiss if I didn't mention triple Malice used by Hydra Reloaded and triple Utu brought by Pandemic Legion. Great fun, and both comps won handily. That said, one of the Utus died in a lovely small bit of tourney flying by The Initiative: a moment after getting a successful tackle on one of the Utus, The Initiative instantly put every damp they had on PL's Oneiros giving them the few seconds they needed to ensure the tourney prize ship's death. Here's where things get a little exhausting for a lot of teams. There are 22 matches tomorrow. Things open with the final two matches from the "best of 16" in the winner's bracket (both of which should be really good matches). But then things go into the loser's bracket with eight immediate matches. By the time those matches begin, there are going to be 16 teams in the first "double slot", plus eight more teams waiting in the wings to take on the winners of each of those matches. the winners of all eight of the first round of loser's matches. As a result, 16 teams will be gone before we finish out those first 18 matches of the day. We'll be saying good-bye to a new team every match from 1530 tomorrow to 1945 tomorrow. That's pretty brutal, particularly if you're one of the eight of ten teams that has to fight twice tomorrow just to stay alive. This is the big reason Rote's been wanting to stay safely in the winner's bracket: for every match you have to fight in the winner's bracket, someone in the loser's bracket has to fight twice. That becomes tiring in a big damn hurry, plus you're giving other teams an enormous amount of intel in terms of your pilots, ships, and comps. You also don't have any time at all to research your opponents as they are thrown into your path in quick succession. Whomever wins the loser's bracket will have taken a long road to do so. So, two winner's bracket matches tomorrow, followed by sixteen loser's bracket matches, followed by four more winner's bracket matches, which includes ours. That will take us to day five next Saturday with four undefeated teams in the winner's bracket and twelve teams in the loser's bracket. 64 were reduced to 48 last Sunday, further reduced to 32 today, and will be further reduced to 16 teams on Sunday. Whew! Match 87: Red vs Blue v. The Initiative. We open with two good ones, of which this is one. I'm rooting for RvB, but this should be a good close match. Match 88: Agony Empire v. Pandemic Legion. Both of these teams did well with reasonably tough opposition in their last matches, but this is the first truly hard match for both teams. This is one Agony must win to prove themselves worthy of finals weekend, same as our Verge match was for us. That said, I think PL will beat them. Match 90: Circle-of-Two v. Curatores Veritatis Alliance. This should be another close match and shouldn't be dull! Match 91: Nulli Secunda v. Exiled Ones. This one should also be entertaining. I think Nulli will win this one in a close match. Match 99: (Exiled Ones?) v. YOUR VOTES DON'T COUNT. Snigg will be in a foul mood after being pushed into the loser's bracket. Should be interesting to see how they react. I think it'll be Exiled facing Snigg, but if Nulli loses to them, this will be Nulli's second match of the day. Match 101: (HUN Reloaded?) v. (The Initiative?). HUN fights End of Life earlier in the day and should have an easy time of them. This second match of the day will put them back on the road to the finals if they win it. They'll face whomever loses the RvB/Initiative match. Match 102: (Shadow Cartel?) v. (Agony Empire?). Here's another double match for whomever loses the second match of the day. If Shadow Cartel beat M.I.F earlier in the day -- seems likely -- then they'll face either Agony or PL here. Whomever is in this match, I think this will be the second best match of the day. Match 107: DarkSide v. HYDRA RELOADED. I can't tell you how much I'm looking forward to this one. It's going to be one for the ages, I think! Match 108: (Red vs. Blue?) v. (Pandemic Legion?). And this one, if it happens, will be a rematch of a great AT10 match last year which Pandemic Legion won. As you can see, lots of really good matches on the docket for tomorrow! Can't wait! Speaking of Shadoo, he got a lot of mileage today out of "it's hot in the commentary booth" jokes. He kept comparing the booth to the inside of a volcano, the center of a desert, on the surface of the sun -- those lights were pretty bright -- all sorts of things. And the jackets required in the studio were gone in the commentary booth by the end of the first match. All the commentators did great jobs today, I thought! This is the best year for commentary we've had in the Alliance Tournament and I don't just say that because I've got two alliance-mates doing the commentary. Or at least not only because. ;-) Everyone commentating is manifestly knowledgeable, smart, well-spoken, and they're catching almost all of the nuances of each match and they're communicating them in a way that makes sense to both new players and vets alike. Bravo, guys! Next year's commentary team has a tough act to follow. By the way, during the DarkSide/Darkness match, CCP Rise had the quote of the day though I didn't catch it exactly. But after ten minutes of nothing followed by a few seconds of explosions, he quipped (paraphrased) "That match was a metaphor for EVE Online in general: you wait a long boring time for something to happen and your wait is finally finally rewarded by a few seconds of amazing excitement." Ain't that the truth? ryu_ibarazaki : Left guy is Giant Mittani, a professional wrestler from Japan. Vim repairs frigates, lets a Vindicator die. Sicarius Draconis was stomped flat. Alar Tangor reps Enyo, lets flagship Armageddon die. RAZOR Alliance, likewise, gone. grim996 keeps his own Oneiros alive for a long while. Because that's the most important thing a logi pilot can do, amirite? You want me to repair people? Oh I guess I could do tha-- (interrupted by explosion) Ministry of Inappropriate Footwork is stomped into the loser's bracket. Enjoy your membership cards, guys! Also, Congrats to Tankmug of Shadow Cartel, for "flying" an entire AT11 match without using his engines at all. He might have MJD'ed once. Other than that, stationary for the entire match, heh. Finally, the new CREST interface into AT matches is pretty freakin' nifty. If you're so inclined, check it out. There's also a great informal CCP stats page that's great fun. As I said last week, tomorrow we face Verge of Collapse in our third tournament match. Needless to say, we've spent a lot of time thinking about and preparing for this one. Verge knocked Rote Kapelle out of the tournament last year, and this year, they could push us into a grueling elimination bracket that just exhausts you with a ton of additional matches assuming you're not knocked out of the tournament entirely. So not only is this a bit of a grudge match, not only is it a match that we have to win to demonstrate that we deserve to get to finals weekend, but it's also a bit of a pressure cooker. Still, I'm feeling pretty good about our chances. Match 67: Outbreak v. Circle-of-Two. I think Outbreak is going to take this one but it should be a good match! Loser goes home, so either way, a decent tournament team is going home after this one so expect it to be hard-fought. Match 68: Perihelion Alliance v. CVA. I expect CVA to win this one (Perihelion have not been performing at their best), but it should be entertaining! Match 73: HUN Reloaded v. The G0dfathers. You'd expect this one to be one-sided, but G0dfathers could definitely make a fight of it. I hope they do. Match 75: Urine Alliance v. Shadow Cartel. I expect this one to be close. My money's on Shadow Cartel -- they've done better with a harder schedule -- but honestly, you could flip a coin. Match 85: DarkSide v. Darkness of Despair. Could be another close one, or could be a Darkside whitewash. Either way, it shouldn't be dull! Surprisingly tomorrow, there are four teams in the winner's bracket that apparently aren't fighting: Red vs Blue, The Initiative, Agony Empire, and Pandemic Legion. All 32 of the elimination bracket teams are fighting tomorrow, which means that 16 more teams will be eliminated from the running tomorrow and we begin Sunday with the top 32 teams. EDIT (27/Jul/2013): An anonymous commenter posted the link for the "Visit Amamake" ad, actually an add for The Heretic Initiative. Clever! Looking forward to the day three matches! Good luck to everyone involved except Verge of Collapse! And let's wrap up T1 battleship month with my favorite T1 battleship, the Dominix. There's only one problem... which one? The Dominix hull is ridiculously, outrageously versatile. The Gnosis came into the game with six low, mid, and high slots, plus drone bonuses and bonuses to every type of medium weapon, either gun or missile, making it EVE's most versatile ship. And yet the simple Dominix ranks pretty close to it in versatility, trading one mid slot for one low slot compared to the Gnosis, and trading all of its weapon benefits for overpowered bonuses to drones and six turret slots. As a result, you can do almost anything with a Dominix. And people have. Herd Domis have been around for a few years now, the concept intended for a smallish roaming battleship fleet that can take a lot of punishment while getting kills. Other than drones, the heart of a herd Domi is actually the high slots where you'll run into two common concepts: 2-2-2 and 3-3. 2-2-2 refers to fitting two heavy neuts, two Large Energy Transfers, and two Large Remote Armor reppers. In the herd Domi concept, the Domis go in as a group, orbiting an anchor, and set up a Guardian style cap chain with each Dominix receiving one energy transfer from each of two buddy Domis (usually the Domis both above and below you on the list of the fleet's pilots in the chat channel). In the less common 3-3 fitting, the neuts are dropped for an additional repper and energy transfer. The entire group drops sentry drones, sets up their cap chain, and starts attacking targets. In some cases, the FC of such a fleet will replace one of the mid slot modules with a Target Painter to use as an aggressive attack module. In this case, the Domi pilots involved will launch their sentries then assist them to the FC. This allows all pilots to concentrate on repairing the member of the group under attack. This fleet concept is called "herd Domis" because the herd usually includes a few battleships of other types that can stay within the repair envelope of the Dominixes and yet provide heavy, reasonably long-range DPS, plus tackle. The Domis are "herding" the other battleships like sheepdogs. In the traditional herd Domi concept, the low slots are built around using all seven slots for tank: a single plate, a DC, two EANMs, and three active hardeners. This produces an almost ridiculously resistant platform. However, the traditional herd Domi was developed prior to the advent of the Reactive Armor Hardener and the Drone Damage Amplifier. The concept above is more aggressive, does 225 more DPS per ship, and is nearly as resilient as the traditional herd Domi thanks to the RAH. If the fleet's movement speed is not an issue -- if the fleet is operating in a home defense capacity, for instance -- one of the EANMs can be replaced with a second plate to further enhance the durability of all ships, particularly if Damnation or Legion armor links are available. The rig slots can similarly be somewhat variable, with between zero and two Egress Port Maximizer rigs traditionally being mixed with Trimarks. This fit has a single Egress rig, which will provide about two minutes of cap endurance before the use of the Cap Booster. Another Egress rig will provide more cap endurance at the expense of buffer. Mid slots are the most variable of all, and there are herd Domi concepts built on no propulsion module at all, or an afterburner. Still, the MicroWarpdrive is most commonly used. On the modern battlefield, this is supplemented with an MJD on each ship. The dual neuts and jammer drones will allow each Domi to individually break scrams with no problem at which point the entire herd can MJD out of harm's way if needed. ECCM is useful to keep the cap chain from being broken... but can be replaced with a Target Painter, Sensor Booster, or point if jams are not an issue. The Omnidirectional Tracking Link further enhances the already absurd tracking of Domi sentry drones, and any ship so reliant on cap should use a Cap Booster. The drones specified are a mix of short range and long range sentries, light and medium drones for super-close range defense, and a flight of jamming drones for breaking tackle prior to getting out of harm's way if needed. Ironically, the biggest obstacle to flying a herd Domi fleet on today's EVE battlefield is that it is recognizably over-powered. Your ships are slow and drone dependent, so many fleets can and will simply refuse to fight you. Where such a fleet excels is in defensive operations around a friendly POS or Player Owned Customs Office, either defending friendly repair ships or doing POCO repairs themselves with their LRARs. A large herd of Domis repping a POCO (with a few attendant Guardians or perhaps a carrier or two) will be an uninviting target to an aggressor. The other major disadvantage to herd Domis occurs in null-sec, where they are quite vulnerable to bombers due to their low speed, high sig, and the swarms of easily-bombed drones that will surround them. Even a relatively small wing of bombers will be able to crack or neutralize a herd Domi fleet... particularly one engaged in defensive ops around a fixed point. As a result, this kind of fleet will be most useful in high- and low-sec where bombs may not be used. In these cases, smart-bombing battleships can potentially be a danger, and some herd Domi concepts replace the two heavy neuts with two large smart-bombs instead. Obviously, if you intend to use sentries yourself, you will need to open range away from them before using your smart-bombs. There is a third obstacle to flying a herd Domi fleet: it requires a great deal of micro-management on the part of every pilot involved (and it is for this reason that the drones of a Domi fleet are often assisted to someone to concentrate on that role alone). Each pilot has drones to manage, a cap chain to set up, repair broadcasts to monitor and respond to, capacitor to watch out for, and neuts to use. 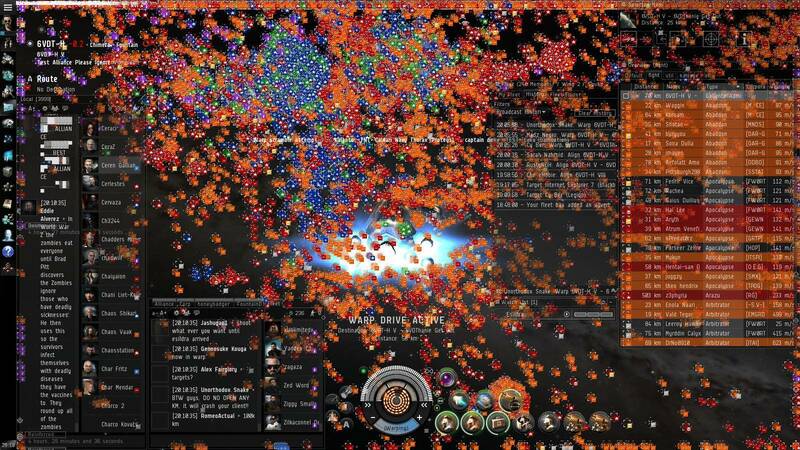 It's "a lot of buttons to push" and some EVE players can't handle it. If you're going to try this comp -- particularly in defensive high-sec war-decs -- take it out and practice it with your fellow pilots. Know an amusing place to practice this kind of comp? Level 4 missions! Take a three- or four-ship herd into The Blockade, Vengeance, or Worlds Collide to practice... That will get you some experience with the drone and cap management and responding to repair requests. There was one other subject regarding the first weekend of CCP's Alliance Tournament that I want to cover since it's notable, but I don't want to belabor it or add to the drama surrounding it. The more I think about it, the last thing this subject needs is drama. But it does need to be covered. As always when I feel the EVE news sites are skipping a news story, I'm going to cover the events as I understand them as best I can, and give you my opinion on the matter. If I've gotten some of my facts wrong, first please correct me in the comments and second I apologize in advance. 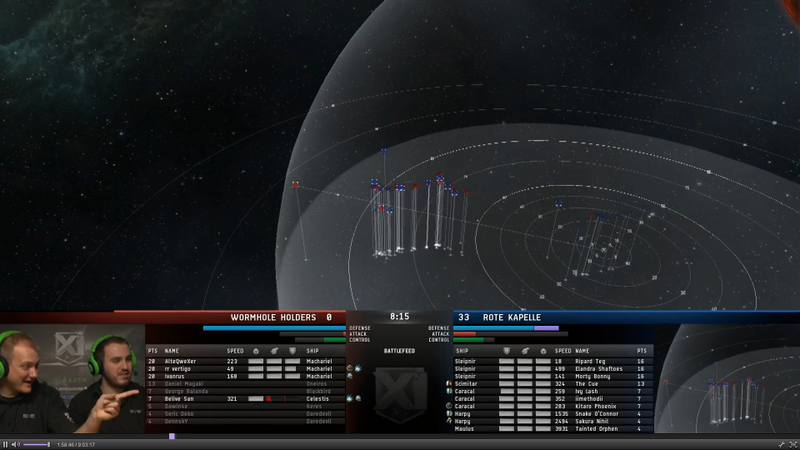 During the AT broadcast on the 20th, CCP played an excerpt from a third party pod-cast on the Alliance Tournament twitch.tv stream. The pod-cast included an excerpt from a song whose lyrics and song title are simultaneously misogynistic and racist in tone. I'm not familiar with the song and I'm not going to pretend I am, but it was in retrospect a wince-inducing moment. Was CCP directly responsible for the song? No! But they erred in not fully researching something that they broadcast to thousands of EVE players and potential EVE players before broadcasting it. You'll notice some AT ads (including Rote Kapelle's) include the titles and locations of their source music for this reason. It's partially a "fair use" copyright concern, partially a concern about hidden messages in that music. Arydanika, a noted pod-caster (Voices from the Void) and EVE personality -- who was already upset by two previous concerns with CCP, and we'll get to those in a moment -- took offense to the song being played on the AT11 stream. "Dani", as she is known, is both a woman and black. While she seems to acknowledge that the song was not played deliberately by CCP, she felt it was the "last straw" driving her away from the community. Now I've crossed paths with Dani a number of times during her time in New Eden. I'm pretty sure I first encountered her in the incursion community two years ago (though she wouldn't have known who I was, since I kept my identity in incursion fleets a secret). And over the last year, I've made a concerted effort to listen to more pod-casts, including Voices. However, my first opportunity to work with her directly was as a Syndicate Competitive League commentator a few months ago. In that, I found her an absolutely fantastic resource to the EVE community: professional, charming, quick-witted, and funny. During SCL, she was an absolute sweetheart and a joy to work with. She's done a tremendous amount of work to benefit the community, including one resource I take advantage of myself on a daily basis, a Skype channel used by EVE pod-casters and visitors like myself. You'll gather I'm a huge fan of Dani's. Arthur: God uses people like you, Lancelot. Because your heart is open. You hold nothing back. You give all of yourself. Lancelot: If you knew me better, you would not say such things. Arthur: I take the good with the bad, together. I can't love people in slices. But let me also be frank. Dani is my opposite in two respects. I am incredibly thick-skinned. Dani is... ummmm... not. And my favorite aphorism about competition is to beat your competition by being better. Dani's philosophy is... ummmm... different from that. I've encountered these aspects of her personality from time to time over the years as well. That Skype channel I mentioned? Its history is checkered to say the least. Dani's reaction to CCP Mintchip being hired has ridden "The lady doth protest too much, methinks" line pretty hard. And Dani generally responds very poorly to any perceived slights on her gender or race, which is kind of ironic considering that she's a former Goon (yes, I've gently teased her about this once). It's probably fair to say that when Dani's site wasn't picked up by CCP for the new year as a Community Fansite, she was kind of looking for the exit. EDIT (24/Jul/2013): I've received a clarification from CCP that many -- perhaps most! -- of the EVE Community Fansites received e-mail notifications in error that they were being removed from the program, including Dani. Chalk it up to unfortunate timing. Now like Arthur in First Knight, I'm realistic about people. I have my flaws -- more than the average person, I assure you -- and so does everyone... including all of my favorite people in EVE Online. Like Arthur, I can't love people in slices. I take the good with the bad, and as I said, I'm a big fan of Dani's... ultimately despite these aspects of her personality. We're all human. We have our good and bad points. Anyway, when this last straw happened, Dani took the opportunity to shut down her EVE Online accounts and announce on Twitter that she was shutting down her pod-cast as well, a more or less classic rage-quit. OK, it's understandable, and we've all lost faith with EVE Online from time to time. If you haven't, you just haven't been playing this game long enough yet. And losing a voice in the community obviously hurts, and I mourn them every time this happens. But then the next day, Dani wrote a longer announcement of her departure on the blog associated with Voices. Go give it a read. I'll wait. Um. Ouch! Yeah, that's pretty harsh. Meanwhile, CCP employees that heard about Dani's departure were upset about it, and upset with the conditions that caused it. CCP Rise almost immediately sought Dani out and apologized to her, and now according to Dani's blog CCP Manifest has as well. (1) Manifest is pretty high up the food chain in CCP (he's ultimately in charge of both Public and Press Relations as well as social media), so him getting involved in this situation shows clearly that CCP was and is taking the issue seriously. But by that time, Dani had already ripped into Mintchip pretty hard. That caused Manifest to withdraw what was obviously an extended olive branch. It's a doubly sad situation because the proverbial straw here wasn't something CCP did on purpose. And that's where we are today. Dani's official quit date is apparently August 7, and in the meantime, this situation is being discussed on the other pod-casts and on EVE Radio. So now you're caught up. Again, if I don't have my facts straight in some respect, someone please feel free to correct them in comments. Things continue to be really quiet on the CCP front. We had a Team Five-Oh stake-holder meeting this week and there were only two team members present. Everyone else was on vacation. The two that were present filled us in on the things they're working on for Odyssey 1.1. But overall... just quiet. 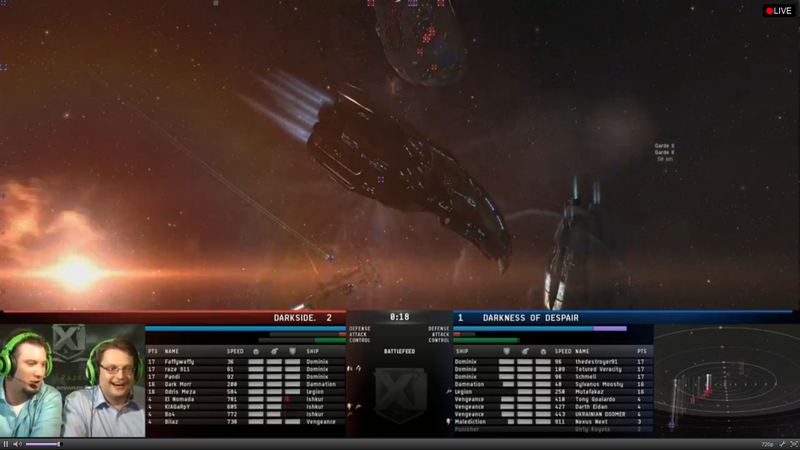 The CCP-CSM channel was likewise pretty quiet and those that were there were busy with Alliance Tournament business. So, not much to share with all of you on that front. 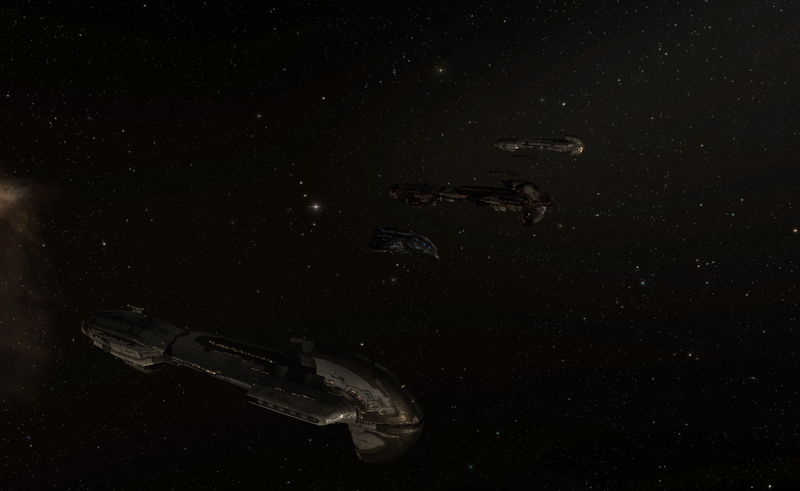 We did also have a second meeting this week with CCP Veritas, though. That was quite interesting! The focus was "EVE servers" so those of us who could attend who haven't been on the CSM forever could understand more about how EVE actually runs on the hardware. He filled us in on a lot of the aspects of nodes, distribution of systems on those nodes, how load-balancing happens, and how the fleet fight notification form applies when it does. Again, really interesting stuff! I also got a chance to bring up the "brain in a box" proposal. The good news here is that you'll all be seeing a dev-blog on the subject of "EVE on servers" soon. As all of you know, CCP Rise is working this week, and produced dev-posts regarding medium long-range guns and HAC rebalancing. As I mentioned in my earlier post this week, the CSM is quite involved in the discussion on this. But Rise is now busy with tourney business so we don't really expect this topic to advance too much for the next couple of weeks. On the player side, our Crowd-sourcing "Reasonable Things" initiative is still running for another couple of days. If you haven't yet submitted your suggestions, please do so! For those of you who have already, thank you! We're really happy to see the player participation on this. Good stuff. Our next CSM8 Town Hall will be in a month or so. This week, I'm going to work with CSM8 members and our partners at EVE University and EVE Radio to finalize a date and a time. Right now, I'm leaning toward the weekend of August 17, hopefully Saturday this time. The focus of this Town Hall is obviously likely to be player questions, concerns, and suggestions about the topics of the Summer Summit. Hopefully, we'll be able to put those topics in front of all of you before that time. Finally, as I've also mentioned, CCP devs aren't the only people busy with tourney business. Ali Aras, Mangala Solaris, James Arget, and myself have been flying in tourney matches (though Ali is now out...). CSM Plays This Game. (tm) ;-) We're also continuing to work on the CSM website. I'll try to have more news about that next week. But that's all for this week! Rote Kapelle 100, Wormhole Holders 0. Not that Wormhole Holders did a poor job. We just came in with a really strong comp, a modification of our Chainsaw/Execution comp from last year that takes advantage of some of CCP's ship balancing work in the year since AT10. It's obviously a comp and a way of flying that we know really well, which is an advantage on tourney day one. Go in with what your pilots already know how to do. That minimizes potential mistakes and avoids razzle-dazzle that can lead to sloppy flying. And it was a doubly fun match for me, though a little surreal: I flew a Sleipnir, we won... and yet I didn't die. Strange. Other than that, pretty straight-forward. We swept in at full speed, spiking anything that we passed on our way to their Oneiros (which turned out to be about a third of the WH team). Once the Oneiros was down, our support turned to their few remaining support ships while the Sleips took out the Machariels. So while the match looked one-sided, I think it just mostly came down to our comfortable familiarity with the comp and how to execute with it. There was an interesting bit when one of the WH pilots apparently tried to bait us to the edge of the arena. 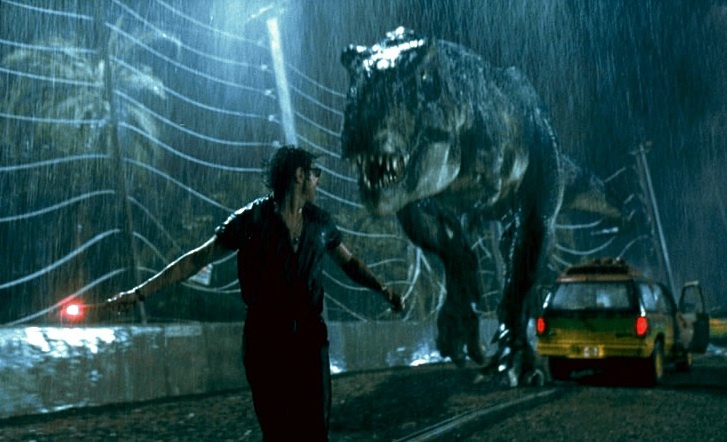 However, a bit like Jeff Goldblum waving a flare while running away from a dinosaur in Jurassic Park, we were a lot more interested in meat than a little red light. ;-) We had two Machariels to eat right next to us so chasing a third wasn't all that tempting. Finally, once the first two Machariels were down, we left the third one alive for about a minute while we looted the field. What can I say. We're poor. ;-) Good luck in the Elimination bracket, Wormhole Holders! Unfortunately, I only got to watch about half the matches today. 32 matches in one day is a lot! And as I said yesterday, I'm starting the process of a real-life move which means a lot of packing and shifting around of boxes. So I eventually had to turn some of my attention to that. As a result, I missed several of the good matches, though I was able to catch all four of the ones I thought would be fun and sure enough, they were. Doubly amusing: at the point that I left, three CSM members had fought in tournament matches and all three matches went 100-0. Ali Aras's Of Sound Mind team unfortunately lost 100-0, but Mangala Solaris's RvB team also beat their opponents 100-0. Best news of all? When I finally had to put the stream aside, there were some 12,000 people watching it, which I believe is far and away a record for people watching an EVE Online tournament. Great news for CCP! On to match two! Our opponents are The Fourth District, which means that my bracket is already wrong. I expected us to be facing Perihelion Alliance but they lost their match yesterday... rather badly. They had an interesting use of battleship MJDs but they were facing an all cruiser/frigate fleet. So once the Perihelion battleships appeared in their back-field, The Fourth District just kited away from them with none of their ships tackled. Whoops! Match 41: Shadow Cartel v. DarkSideDOT. As I said yesterday, DarkSide is a great team but Shadow Cartel is often underestimated. This match will show if SC has what it takes to get to finals weekend. Match 47: Confederation of xXPIZZAXx v. Agony Empire. These are two teams that enjoy doing goofy things. I doubt this match will be dull. Match 48: Pandemic Legion v. Drunk 'n' Disorderly. It's followed immediately by another that also should not be dull. I'm looking forward to a great set of second day matches! I'm going to keep mentioning it because it's still relevant: right now, I'm learning exactly how many plates I can keep spinning at the same time. Right now, that means two major work projects, this blog, the CSM, tournament practice, a real-life move, my daily exercise, normal day-to-day stuff that we all deal with, and -- oh yeah -- the desire to have some unscheduled gaming time now than then. ;-) It's a lot to keep track of! So far, I'm mostly keeping up, but I'll be happy when one or two of the items drop out of the pile to free up time for the others. The star is CCP Veritas, who's put in some heroic work in the preliminaries leading up to the tourney. I don't think a week has gone by yet that I haven't had some inane question, suggestion, or sarcastic remark for him. I do not envy the guys doing commentary tomorrow and Sunday. 32 matches per day is a lot. The tournament is double elimination, so there will be 16 teams eliminated tomorrow: those teams that lose on both Saturday and on Sunday. 48 teams will continue on to the second weekend. We've been working hard and we're confident that we'll be among them. In particular, I'm pleased with our bracket. We're nicely isolated from the really tough teams so I don't expect we'll be knocked out early unless we make some big mistakes. Four matches I'm particularly looking forward to on Saturday? Match 6: Verge of Collapse v. OutbreakDOT. Last year's tournament champions versus a very tough tourney competitor. Should be good. Match 17: Noir. Mercenary Group v. Shadow Cartel. A lot of matches on Saturday are going to be one-sided but I think this one might be fun to watch. Match 18: HUN Reloaded v. DarkSideDOT. I have a lot of respect for DarkSide and of course the Huns pushed a lot of people out of AT10. Match 22: The G0dfathers v. Urine Alliance. This is another one that has the potential to be really close. More on this topic tomorrow! Good luck to everyone involved!